Ford’s Theatre, where Lincoln was assassinated by John Wilkes Booth, is a national historic landmark and one of the most visited sites in Washington, DC. Visitors can enjoy a short talk by a National Park guide and learn the fascinating story of Abraham Lincoln’s assassination. On the second floor of Ford's Theatre, you can see the boxseat where Lincoln was sitting when he was killed. On the lower level, the Ford's Theatre Museum displays exhibits about Lincoln’s life and explains the circumstances of his tragic death. The historic site also functions as a live theater, presenting a variety of high quality performances throughout the year. Ford's Theatre was renovated in 2009. A state-of-the-art Center for Education and Leadership was built across the street in 2012 giving visitors the opportunity to learn more about Abraham Lincoln's life and his presidency. Six buildings on both sides of 10th Street NW have been linked together to provide a modern museum. Admission is free, however timed-entry tickets are required. Fords Theatre is located just a few blocks from the Gallery Pl-Chinatown Metro station. Paid parking is available at several independent neighborhood garages: the 24-hour QuickPark at the Grand Hyatt (entrance on 10th Street between G and H Streets NW), the Central Parking Garage (entrance on 11th Street between E and F Streets NW), and the Atlantic Garage below Ford’s Theatre (at 511 10th Street, NW). Ford's Theatre Museum is open daily from 9 a.m. to 5 p.m. except Christmas Day. Center for Education and Leadership will be open daily from 9:30 a.m. to 6:30 p.m. Arrive early in the day to avoid crowds. Reserve tickets in advance if possible. Allow 2 hours for your visit. Housed in a building directly across the street from Ford’s Theatre, the Center features two floors of permanent exhibits addressing the immediate aftermath of Lincoln’s death and the evolution of Lincoln’s legacy; a Leadership Gallery floor to be used for rotating exhibits, lecture and reception space; and two floors of education studios to house pre- and post-visit workshops, after-school programs and teacher professional development; and a distance-learning lab outfitted with state-of-the-art technology that will allow Ford’s Theatre to engage students and teachers nationwide and around the world. The building also houses the Ford’s Theatre Society administrative offices on its upper levels. After Lincoln was shot at the Ford's Theatre, doctors carried the President to the Petersen House, a three-story brick rowhouse across the street. He died there the following morning. The National Park Service acquired the Petersen House in 1933, and has maintained it as a historic house museum, recreating the scene at the time of Lincoln's death. See a photo of the Peterson House. 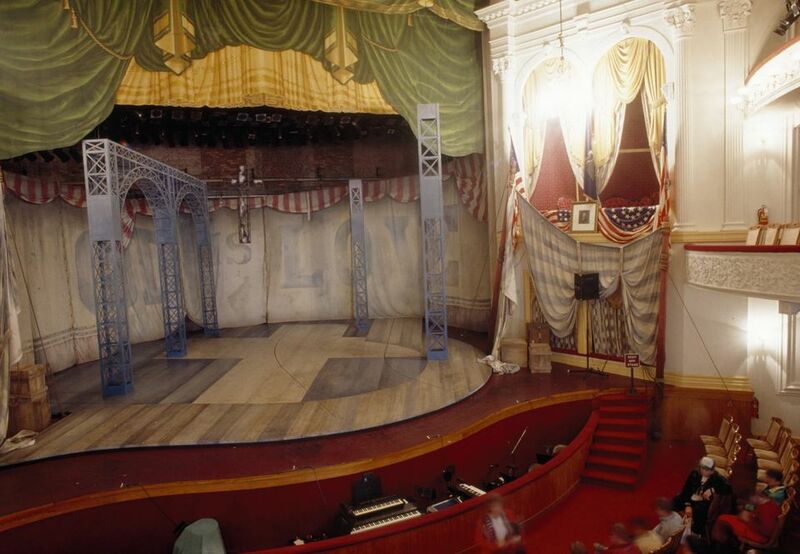 During the spring and summer months, Ford's Theatre Society offers History on Foot walking tours, which are guided by actors playing characters from Civil War Washington. The tours begin at the theatre and offer a unique way to explore downtown Washington DC.